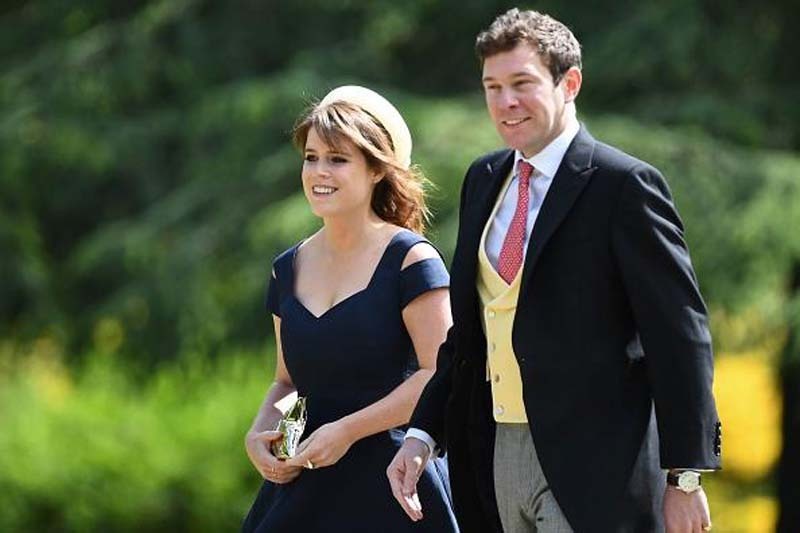 Princess Eugenie and Jack Brooksbank recently shared an intimate moment with each other at their friend’s wedding. The couple, who is set to tie the knot on Oct. 12 at St. George’s Chapel in Windsor Castle, were photographed holding hands at Charlie van Straubenzee and Daisy Jenks’ nuptials at St. Mary the Virgin Church in Frensham, Surrey. While outside of the church, Brooksbank also leaned in to kiss Princess Eugenie’s head. The 28-year-old princess all smiled at their friend’s big day. For the outing, Princess Eugenie and Brooksbank wore matching clothes. Sarah Ferguson and Prince Andrew’s daughter wore a light blue dress and white jacket. Brooksbank, on the other hand, wore a grey and black suit and light blue necktie. [post_ads]Princess Eugenie and Brooksbank are planning their wedding at the moment. But last week, they also took a break from the preparations by going on a short vacation to Italy. The couple was photographed basking under the heat of the sun on the Amalfi Coast. The granddaughter of Queen Elizabeth II was also seen feeding her fiancé during their lunch. She also stroked Brooksbank’s cheek at one point. Princess Eugenie also made headlines last week after she and her older sister, Princess Beatrice, graced the cover of British Vogue. During their interview with the publication, the siblings said that they are very “real” and unlike other royals because they have independent careers. Despite their personal success, Princess Beatrice and Princess Eugenie said that they have struggled with the criticisms they’ve received on social media. “It’s hard to navigate situations like these because there is no precedent, there is no protocol. We are the first: we are young women trying to build careers and have personal lives, and we’re also princesses, and doing all of this in the public eye,” Princess Beatrice said.